Yesterday a pit bull attacked an elderly lady, a person mowing a lawn and some motorcyclists. I was concerned for my neighborhood children when a couple moved into our area. I asked if there was anything that could be done and of course, we came to the conclusion that until somebody gets hurt or killed it wouldn't be addressed. OKAY!!!!!! Here we are....don't bother calling animal control because she owns a lot of pits and defends them whenever she gets a complaint. When we call an official in this position it should be handled on a professional level, not a personal one. I don't care if she has 20 tigers....it's got nothing to do with the concerns of citizens. I can honestly say that I'm not against the breed itself, as I also have a breed that could do more damage than a pit. These owners need to be held responsible. If you don't know how to raise a dog, don't get one that needs a strong trainer. Please, Please, Please- let's do something to protect the children of our city before it's too late. Minonkâ€“ The Woodford County Citizens Against Substance Abuse (CASA) in partnership with the Minonk Police Department will be hosting a Prescription Pill Collection on Tuesday, March 27, 2012 from 3:30-5:30 pm at the Minonk Village Hall. Citizens of the Minonk area are encouraged to come to the event and drop off any expired or unused medications. Any prescription or over-the-counter medications may be collected at the event, including pills, capsules, or liquids. The Minonk Police Department will be helping the CASA group by arranging to send the collected drugs to an Environmental Protection Agency approved disposal site. The abuse of prescription medication has become a nation wide epidemic. According to the FDA's website, "Medicine take-back programs for disposal are a good way to remove expired, unwanted, or unused medicines from the home and reduce the chance that others may accidentally [or intentionally] take the medicine". For more information about the Prescription Pill Collection, contact the Woodford County Health Department at (309) 467-3064 or visit our website at www.casawoodfordcounty.org. The family of Judy Davis and Sam Davis would like to thank everyone that has kept us in their prayer, sent cards, flowers, and food. You will always share a special place in our hearts. The Ladies in Rutland served the dinner and did a wonderful job. We would also like to thank Rev. Sinclair and Rev. Barclay for the services they shared with the family. Culvert-Johnson & Froelich Memorial Home was in charge of all the arrangements. Judy and Sam will be greatly missed by all that shared the good times in their lives and the love they shared with their family & Grandchildren. God Bless to all. The Minonk to Peoria St. Jude Team is off and running for the 2nd year. We are so excited to have many more runners this year which means we are in need for more transportation for our runners. We have 3 RVS and are in need of 5 for the run. The date is July 21, 2012. We take awesome care of the vehicles and have them clean and gassed up when returned. We would need the RVS for the 21st and return them on the 23rd. This allows us to pack them and then get them ready to be returned. These are greatly needed for the comfort of our runners and if you are able to help it would be greatly appreciated. For more information please email Jason and Jodi Timmerman at jasontimmerman@mchsi.com. Thank you for your consideration of this matter! Thank you Rick for the write up. I just want to correct my email address so we don't get any mix ups, it is hovey_sis@yahoo.com. Hard to believe that I am typing this, but We the MDR Class of 1982 are planning our 30TH class reunion. Festivities will be held in September on Labor Day Weekend. We still have several class members awol and quite a lot of work to do. To provide info or to volunteer to help please contact Sis Hovey (Geringer) at hovey-Sis@yahoo.com. There will be more info coming soon thank you. We are still looking for runners for our 2nd annual Minonk to Peoria St. Jude Run! Come and join us on Thursday, April 12th for a mandatory meeting at the First Baptist Church in Minonk at 6:00. For questions, call Jodi Timmerman at 309-432-3061. I want to congratulate the basketball for their great season and I also agree that the teams that recruit their players should have their own tournaments. Its not fair that we can't go out and recruit big tall players like they can. Our conference has to go with what we have - want to say even though we had a good season. Congratulations to the 5th grade Fieldcrest West Lady Knights on their win of 1st place consolation at the St. Mary's 5th & 6th grade Extravaganza held in Pontiac on March 3, 2012. 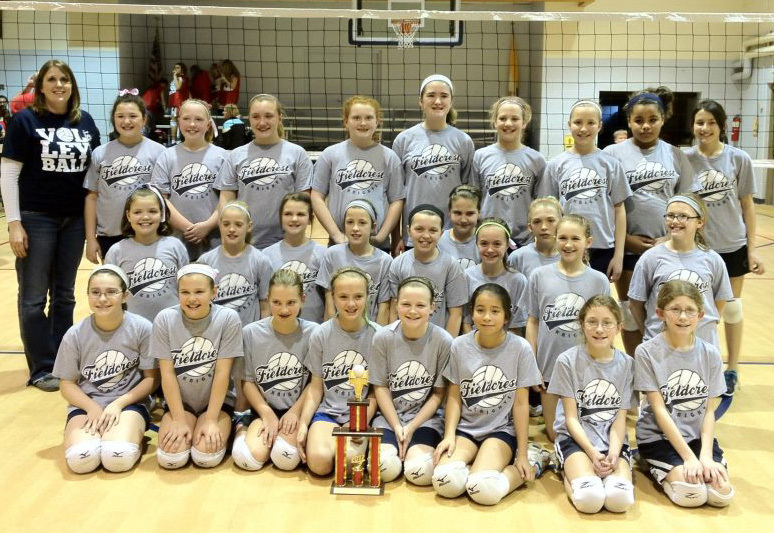 The 6th grade Lady knights also brought home the 4th place trophy. Good Job girls! Click here for picture of team. Volunteers are needed to help out on the July 4th Committee. A shortage of volunteers may result in a cutback on some of the services and features. Anyone wishing to volunteer should call Julie Redenius at 432-2380 or Stephanie Fuchs at 432-2615 or contact City Hall at 432-2558. The 55th. Reunion of the M.D.R.Class of 1957 will be held on Saturday, June 30th, 2012 at 6:00 P.M.at Mona's in Toluca, Il. Can someone tell us when the Minonk Townwide Garage Sales will be this Spring? 2012 Fieldcrest JFL sign-up for 3rd-8th Graders (2012 /2013 school year) will be: Saturday, April 21st from 9-12 at the Fieldcrest High School Cafeteria. 4. Football players to weigh in. ALL Players must have a physical and all paperwork turned in by the first practice, date to be determined. Any questions, please contact Russell/Lanna Ruestman 309-432-3909, Nate Lorton 217-254-3932, or Dave Harsted 309-432-2137. I want to congratulate thedance team on a very successful year. I have enjoyed going to watch them perform and receiving that state champion trophy. I know that you put in a lot of hard work but it pays off. Also to coach Fortner and coach Moline for all their hard work and hours it takes to have a great dance team that Fieldcrest has. I wish the seniors good luck in the future, that what ever they choose we will be proud of them. I want to Thank everyone who has supported me over the 35 years that I owned the Country Florist. I couldn't have done it with the the Wonderful Friends that have helped me over the years! I have always consider them Friends not just employees.We have been thru a lot together...laughter,tears, stress and just trying to get thru life. Also to all the great people I have met thru the years,whether it was Weddings, Birthdays, Anniversaries, Funeral Tributes, or just Because Flowers...I do appreciate all your support and friendship. I have been sooo blessed. I survived 35 years because of you. I wish Lindsey all the best...I know she will do a great job. She's creative, hardworking, and she loves her job! She will always give you her all!!!! Hope to see you all at the shop from time to time. Please add my written congratulations for the Knights to those good words of Mr Johnson and Mrs. Dunham and all the spoken words that have come from all of those in the Fieldcrest communities. All are well deserved! Great achievements like this come from a team, coaches, school staff and the encouragement that comes from many sources. Be proud of the achievements, especially those many over time games that ended in your favor. I would like to add my congratulations to the Fieldcrest boys basketball team, and coaches of course, for another great season. What these young men have accomplished over the past several years is absolutely fantastic. The entire Fieldcrest community is to be congratulated for accomplishments like this do not occur without the support of everyone in the community. The parents of these young men should be especially proud of their sons. As the old adage states, "the acron does not fall far from the tree". Once again it is time to thank the community for their support. We served around 800 paying customers again this year. Our winners this year were. Thanks to all who donated and supported us in any way! P.S. Go Knights good luck Tues and beyond!! And congrats to the Fieldcrest poms/dance team 2 State awards!! March 5 through March 19 the FHS Band/Colorguard will be selling cheesecakes. The cheesecakes are from the GOURMET'S DELIGHT, INC. and include TRADITIONAL $14.50, CHOCOLATE CHIP $14.50, COOKIES & CREME $15.50, KEY LIME $15.50, TURTLE $15.50, STRAWBERRY $15.50, RASPBERRY $15.50, PUMPKIN $15.50, and VARIETY $20.00. They make very nice desserts for all your Easter entertaining!! Delivery will be April 3. Contact any FHS Band/ColorGuard member to order yours today!